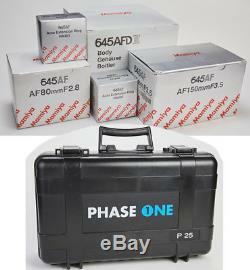 Mamiya 645AFDIII Medium Format w/Phase One P25 Digital Back + 80mm + 150mm Set. This listing features a desirable Mamiya 645 AFD III Medium Format body with dedicated AF 80mm f2.8 and 150mm 3.5 lenses as well as NA-401 and 402 extension tubes and last but not least, sought after Phase One P25 22MP Digital back with low shutter (52K on back and about 20K on body). As you will see in the following pictures, all items come in original boxes in mint condition, showing very little use, mainly studio, pampered and fully operational. All optics are mint inside out, blades free and clean, focus smooth fast and accurate. The 150mm whistles a little when focusing - common on this lens. Thank you for your understanding. The item "Mamiya 645AFDIII Medium Format withPhase One P25 Digital Back + 80mm + 150mm Setup" is in sale since Thursday, November 8, 2018.